Much of the world already knows this… Here’s a video from Torbjörn Albért in Uppsala, Sweden. But I’m writing today for a UK audience. Here, cycling on snow is seen (by many) as odd, dangerous, or simply as impossible. 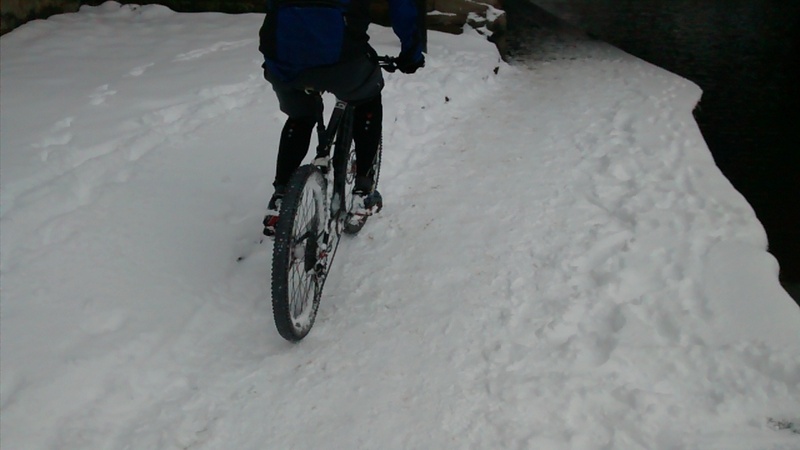 It’s assumed that it is simply not possible to cycle on snow. Back when I was younger and more energetic, and when hadn’t spent so much time on a bicycle, I took mine to a snowy park at midnight. And I went around in circles learning about how it handled on what was a very slippery surface. There was no traffic. I put the saddle down so that I could put my feet on the ground when I needed to. This taught me a lot. I fell off when I did some things. I didn’t fall off when I did other things. If you’ve never cycled on a slippery surface and you intend to, then doing something like this might be helpful. I popped out for an hour last night – everyone had been sent home from their workplaces because of the severe weather. Buses had stopped. Cars were stationary. Walking was pretty good in some places because the snow hadn’t frozen – but cycling was faster. I managed to cycle at a steady 10mph average pretty much without stopping – and getting faster as I became more confident. I spoke to a number of other people out on bikes and they seemed to be enjoying the experience. Several had specifically chosen to go out, like me. I felt at a much lower risk of injury during that hour than I had been during 15 minutes on foot earlier in the day. There ARE some additional risks when cycling on snow – but that’s also true for walking on snow, or (obviously) driving on snow. And of course there are situations where the bicycle may not work at all – including deep loose snow, a few centimetres of heavy wet snow, or plain smooth ice (unless adding studded tyres to the bike). There are also situations where using a bicycle in snow would be dangerous. But here are my personal experiences – what I’ve found makes it possible for me to use a bike in the snow – and indeed to make trips across the city that others (trying to drive or take public transport) are finding difficult. And do note: I have fallen off my bicycle on snow and ice (and during a mountain bike race hurt myself too)… and I’ve fallen over on snow when walking (and hurt myself). Both carry the risk of broken bones or worse. I’m not suggesting you do this – you might hurt yourself – it would be much safer to stay at home wrapped up in a cosy bed with a mug of tea (just make sure it’s not too hot because you could burn yourself). I can’t be bothered with the stress so I stick to the snowy back streets or off-road paths. And yes it makes me really angry that the roads are cleared before the pavements – but that’s another story. I also only cycle in places where a fall wouldn’t put me under the wheels of a car/bus/truck. And I may wait for people to drive by before continuing if I don’t think they are driving carefully enough. Something with wide handlebars and softer/wider tires is much easier to control than a racing (road) bike when on broken snow and the bike is sliding around. Lower pressure tyres grip better. I check the minimum pressure written on the tyres and set mine to that pressure. I use a bike which has tyres on it which can be run at low pressure. Pumps with pressure gauges are pretty cheap. If you skid your back wheel it’s often possible (with some practice / in many situations) to recover. If you skid the front wheel recovery is unlikely. When I set out on a snowy day I find somewhere safe, get myself into a position where I know I’ll not fall off (feet off the pedals, prepared for a skid) and I brake with the back brake – several times and progressively harder. That gives me lots of good information about how grippy that particular surface is. I do that several times to check surfaces as I find myself in different environments. As above, a skid of the front wheel on a corner will have you on the ground. Cycling in a straight line is MUCH safer on a slippery surface than even a gentle turn. I may put my inside foot out close to the ground if turning on a surface I’m not sure about – I know that if the bike slips in this circumstance (only if travelling slowly) I can avoid falling off. I cycle at a speed which will reduce how much I’ll hurt myself if I do fall off. I don’t tend to fall off, but this seems only sensible. This also allows me to stop if I see something riskier ahead. When on actual snow – particularly if it’s not hard and flat – it’s quite possible to find that the bicycle slips around a bit. With practice it’s possible to control this and to keep moving. To a newcomer this might be alarming. I wouldn’t do this if there was a moving vehicle anywhere near. Anybody who has used a mountain bike on slippery mud should be familiar with this experience. A bike sliding around isn’t necessarily going to have you falling off. If it snows properly and I’m not at work I go and practise a little. Not only is this fun – I’m relaxed and not in a hurry – it also keeps my skills up to date. As the snow disappears and I return to the roads I also remember this – black ice (ice that you can’t tell is there) is a real thing… I’d always assumed that ‘black ice’ was a phrase meaning ‘I was driving too fast and didn’t see the ice because it wasn’t very obvious’. A few years ago I actually encountered genuine ‘black ice’ – proper smooth polished and ultra-slippery ice that just looked like a wet road. Fortunately for me the man in front fell off his bike. As I’d practised cycling on slippery snow all my skills were brought into action – a foot down, braking with the back brake (I had to stop because he was on the road). A graceful pirouette later I stopped – although getting off the ice to the side of the road was interesting. ….. EDIT: I forgot these key points (11 / 12) ….. Even a little slope sideways – to the right or left of the bike – can make it slip out from a rider. The slip can be sudden. Clearly it also matters how grippy the surface is in this circumstance. If you have cold hands you need to buy warmer gloves. Personally I use a pair of 20 year old ski gloves which I bought in a sale for a bargain price. They’re very much warmer than anything I’ve ever bought in a bicycle shop (despite the fact that they are ancient and worn out) – even when the bicycle gear has claimed to be suitable for the most extreme situations. You can see the original comments in the comments section below the article. Metal surfaces (tram tracks, manhole covers, drain grates) are very slippery when covered by a little bit of snow. It’s possible to buy studded tyres. I’ve never used these, but I’ve seen winter mountain bike races on snow and ice won only by those using them so I’m in no doubt at all that they work. I’d guess that they make the most difference on ice rather than softer snow. If this is your first visit to the blog and you found it interesting then there’s much more to read. You might like to start on the front page to see what’s recent, or with this short list of most popular articles. 11) Metal surfaces (tram tracks, manhole covers, drain grates) are very slippery. I forgot that one – so I added it into the article. Thanks. For black ice – studded tyres. Magic. I’ve added that at the bottom of the article – thanks. I’ve never got around to using them but I saw them in action on the 24 hour Strathpuffer race, on one of the years when it was seriously icy. Winter studded tyres work exceedingly well on ice (you can cycle on sheet ice that you wouldn’t be able to stand on), pretty well on compacted snow, and are about as good as an equivalent non-studded tyre (which is to say the really knobbly mountain bike style ones at really low pressure are better) on loose snow. Their main weakness is the re-frozen ruts made by vehicle tyres, which have the same sort of effect as ruts in mud that have dried solid: pick a fight with one that’s too big at the wrong angle, the front wheel will tramline and down you go. Studs, knobbles and soft compounds won’t help you there. The downside is that they’re really hard work compared to normal tyres, you shouldn’t corner or brake too hard to avoid ripping the studs out (though replacement studs are usually available) and they make a noise a bit like a gravel driveway when you ride on tarmac. The other way to cycle in snow and ice without falling off is to have more than two wheels. With regular tyres a tricycle or quad isn’t guaranteed traction (or braking, or in extreme cases much in the way of steering), putting you in the same sort of position as car drivers, without causing anywhere near as much danger. With winter tyres, a tadpole trike laughs in the face of everything except solid frozen ruts! Thanks – some stuff I didn’t know in there. Another good piece – thoughtful advice. All of the above, +1 for hidden obstacles. I’m wary of changes in colour / height in surface – not only signaling obstacles beneath but loose / icy compacted snow. Either means changes in traction. Oh and since you won’t be rushing it’s a great opportunity for enjoying human interaction. Share a word passing people on foot (considerately) or maybe even help out people with stuck cars (twice today). Testing for grip tip: (lightly) touch a foot to the ground while you’re coasting. After a while you get a similar intuition for the correlation between the drag on your foot means and how hard you can brake/turn. It’s probably a little less accurate than your brake-based test, but it has the upside of you not slowing down much. I’ve never tried that – it’s an interesting suggestion. Shame the snow has gone – I’d like to test it. Damn, Robert. I could have told you so much about biking in all kinds of snow conditions. But you already got a very good analysis! Here in Uppsala, Sweden the winter temperatures move back and forth around zero degrees down to -20 sometimes, which is good for skating but not so much for biking. Frozen wet snow with tracks is the worst. I too, practise to brake, steer and keep balance with every year’s first snow. It’s fun, but it is also very very helpful. You can go att ordinary speed straight forward, but turning needs slower speed or larger turning radius. I have a winter bike with studded tyres, so that I every morning can decide which bike to choose. Actually I hardly ever choose the winter bike. it has to be very very awkward conditions. Five years ago it was so bad I used it for two days – and even had a helmet on! 😲. But that’s me. Many Swedes have started to put on studded tyres to keep biking through winter in the beginning of the season. If you keep the bike outdoor the handles are very cold. Good gloves are a very nice thing. i fall regularly every year, but never by the snow. It’s the black ice. Or the very first ice, which comes in the autumn after a clear night. I can tell you a lot about snow clearing in Sweden, but as you state, it’s another thing. Biking in snow is not bad. Actually the further north in Finland you get the bigger is the biking travel share. One advice: Beware of bridges. They get slippery before anything else. Hey Torbjörn – so nice to hear from you. I should have thought to get your contributions on this article. Do you have any nice snowy Swedish photos (with people cycling) to show the UK that other countries keep going! ?